Although not required, I strongly recommend that partnerships have a partnership agreement in place to detail the business ownership and responsibilities of partners. The clearer and more complete the agreement, the less that is up for debate or disagreement when partners don’t quite see eye to eye. Make sure you clearly lay out each partner’s stake in the formation and ongoing finances of the business. How much will each partner contribute to start the business and what will each partner’s responsibilities be for future needs? In your agreement, define what each partner will put forth—not only in the amount of money, but also with regard to time, effort, customers, equipment, etc. You’re all in the business to make some money and create and sustain a comfortable life, right? 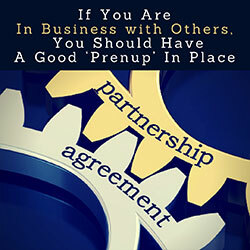 Your partnership agreement should detail how the partners will split your business profits? How much will each partner get paid and who will get paid first? Outline not only how profits will be distributed, but also define if each partner will be paid a salary (and of course how much that salary will be). What if something changes with regard to ownership of the business? If you sell it, which partners will get what? What is your partnership’s position on taking on new partners? If one partner wants to withdraw from your business, what happens then? What are the options for buying out another partner? Your agreement should carefully describe how ownership interests would be handled in various scenarios like those and others, such as in the event of any partner’s death, a retirement, or bankruptcy. And to protect your business from a partner leaving, setting up a new company, and stealing your customers, you should also consider adding in a non-compete clause. Better safe than sorry! I can’t emphasize enough how important this is! Trust me, you and your partner(s) will not agree wholeheartedly about everything. You need to define how day-to-day management and long-term decisions will be made. Who gets the last say? Identify what types of decisions require a unanimous vote by partners, and what decisions can be made by a single partner. By setting up a decision-making structure that everyone understands and has agreed to, you’ll have the foundation for a more friction-free business. Ugh! No one wants to think about this, but you should. If things get ugly between partners, how will disputes be handled? Your partnership agreement should define the resolution process. Should mediation be the initial step? Will you require arbitration to settle differences? Keep in mind that if a dispute goes to court, lawsuits become part of public record. Setting up how you’ll handle disputes will take the guesswork out of navigating dissention. A partner getting sick or dying—What happens then? A buyout—How will the business be evaluated (and what is the split) if an offer is laid on the table? Circumstances under which you can modify your partnership agreement—and the process for making changes. These are the most common issues. And there are numerous others you should think about. Your agreement should also include what steps should be taken to legally end your partnership. You might opt to do this if you and your partners can’t agree on the future of your business. Also research what your state requires to dissolve partnerships. State law governs dissolution and your state’s website should define the process and provide the forms you need to complete.